Education and training to being a thorough yachtmaster is far more than just acquiring the necessary certfications, which in my case has been the basic sailing class (which can be read here), the official “Sportbootführerschein” SBF license as it is called in Germany (read it here), the Short Range Certificate (SRC) for VHF radio (read it here) and the “Sport Küstenschifferschein” SKS, the German equivalent to the RYA Coastal Yachtmaster (which can be read here). It´s far more than that: Constant training. 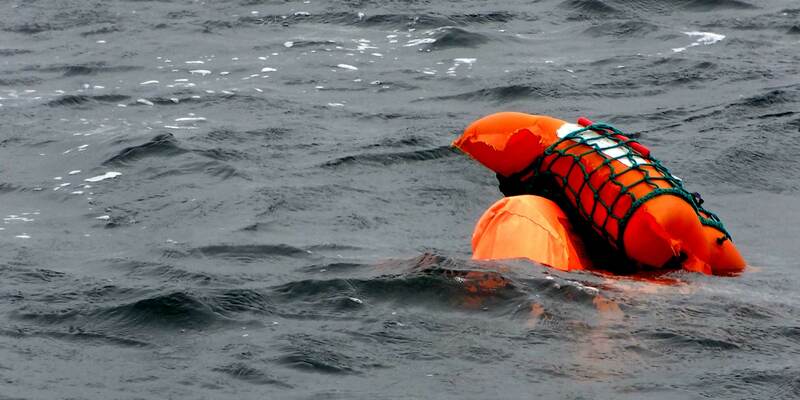 For example training extraordinary situations like the Man Overboard (MOB). Last weekend I was honored to getting a call from Richard Jeske, founder and owner of Well Sailing School with an invitation to accompany him and his crew for a day out testing the MOB Code of Practice. We did not start right away but met in Richard´s sailing school for a thorough briefing. I was astonished to listen to Richard as he was planning the day and told us how he was going to execute the different sessions. His aim was to have two main items tested today: First task was to seek the best maneuver to return to the MOB, second was to seek a method how to get the MOB back on board of the ship as fast and convenient as possible. “I want to clearly separate these two tasks and find an answer to both questions.”, he said. I was starting to rain, wind was freshening up – promising an adventurous day. As you may know, I am a fan of the Figure-8 maneuver (read here why), which I regard as a simple yet fast way to return to the MOB person, but Richard and the others quickly rejected execution of this standard procedure: “Figure-8 isn´t really a suitable maneuver from our point of view”, Richard explained, “because it takes too much time and will bring too much distance between ship and MOB – making it almost impossible to keep the MOB in sight when weather and waves get rough.” So the skippers discussed other maneuvers, like the Quickstop or the Fast Stop, but in the end decided in favor of the so called “Hamburg Maneuver” – a kind of mix between heaving-to and Figure-8. I was excited to witnessing this maneuver: “In this case, with those two rescue systems, it´s the best maneuver we guess: There´s as less working the sheets as possible,” Richard explained. 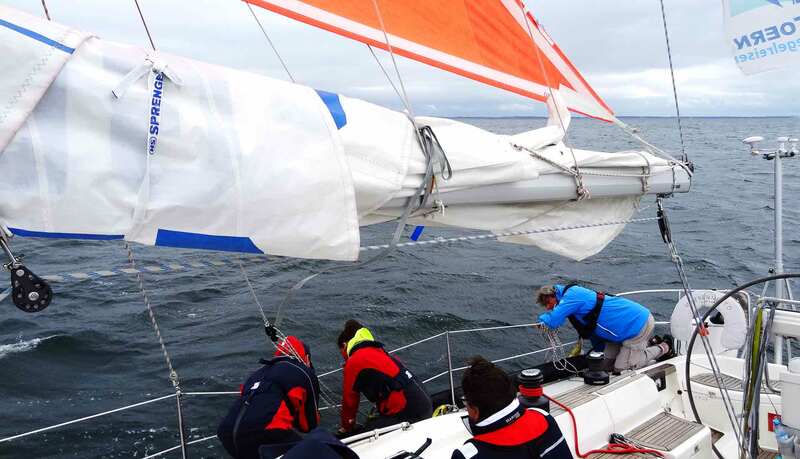 “And best of all: No loose sails and beating sheets posing additional risks of being injured when hit.” Hamburg Maneuver means to tack as fast as possible, haul in the main, leave the jib aback – cross one´s wake and put the ship into the wind without letting loose the sheets. “It´s both quick and I would say the best maneuver from my point of view”, said Richard. The others agreed. Second discussion was about how to get the person back on board. 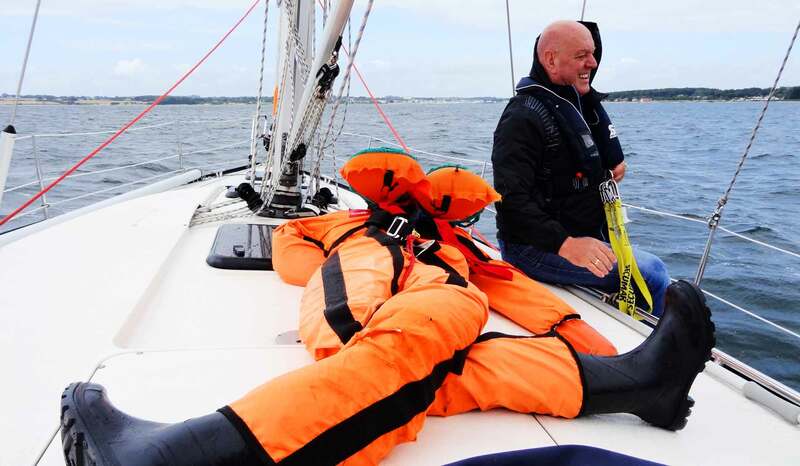 We first agreed to have some testing runs with our Dummy Karl before two of the crew volunteered to enter the waters by themselves. Why´s that? 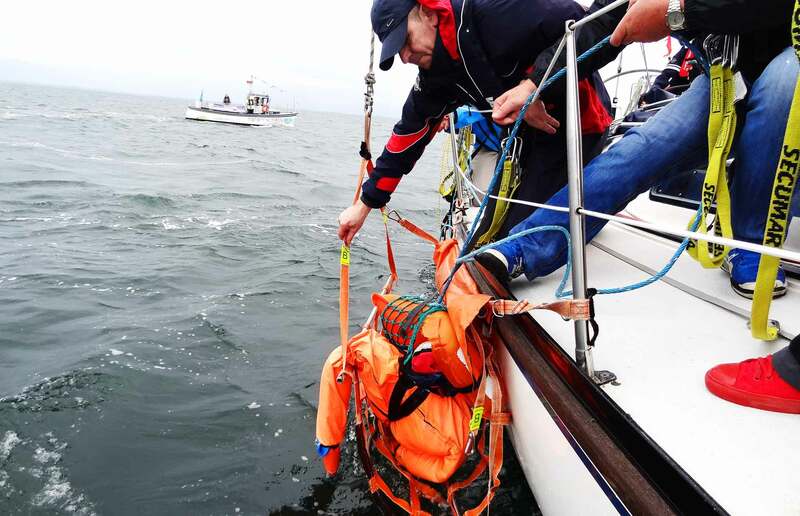 Because, getting to grab a buoy or a fender is one thing: Hoisting a person in full clothing, completely soaked and weighing some 55 kilogram is a completely different task. Lucky who is able to climb back on board by means of bathing platform or ladder, but what about an unconscious crew member? We were to test two rescue systems, both utilizing a form of net which is to secure the person and a halyard winching the MOB back on board. Again, I was excited to getting a chance to witness these rescue-systems in action under real life conditions. 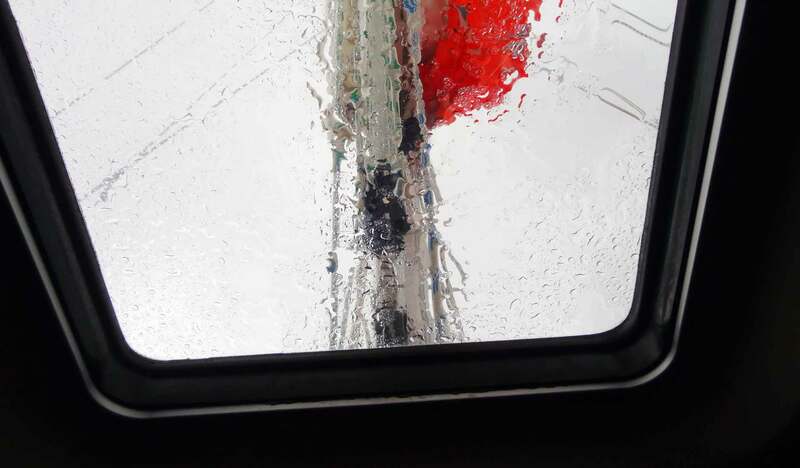 As we finally prepared the boat after some two hours of briefing and discussion to casting off, a short downpour was a harbinger of “perfect MOB-weather” which was welcomed by MERENNEITOs crew. 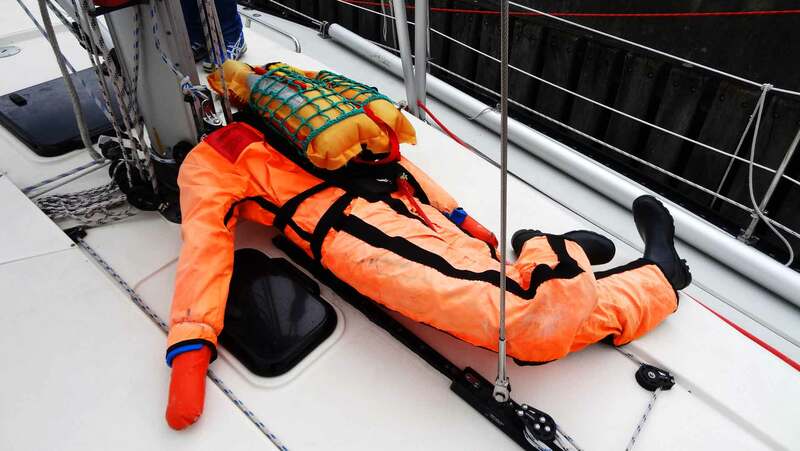 Practicing Crew Overboard in perfect sunshine on smooth waters wasn´t really appealing. So we were casting off, readying the sails. Our sailing yacht was accompanied by a small cutter, manned with a skilled sailor and two reporters of the German sailing magazine “Segeln” who were to observe our efforts for a story. The cutter was also a question of safety when we would have the real persons in the water – just in case. Boat was rolling, clouds appearing dark and scary but our spirits were high. 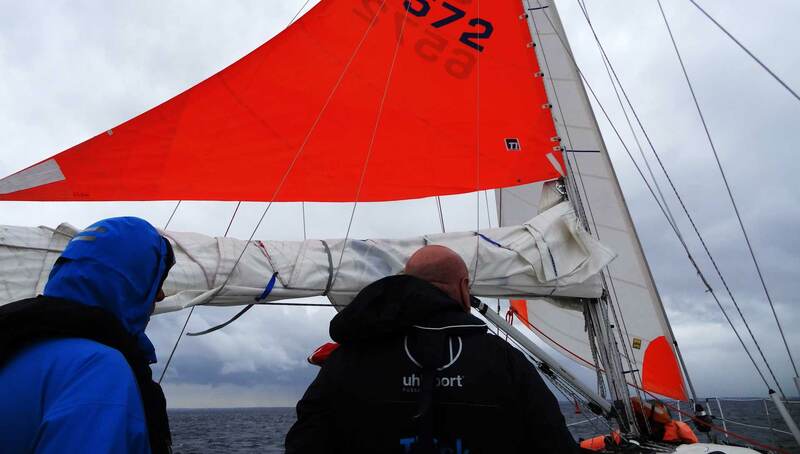 As we´ve had a clean Beaufort 4 with gusty winds our skipper decided to go for storm jib and trysail. Again, it was fascinating to see the X-442 sailing yacht making 7.6 knots! “Look at the fantastic speed!”, skipper Andreas shouted with joy: “With handkerchiefs as sails! Unbelievable!” Well, that was my impression too – even when hove-to the X-Yacht was going at 3 knots. (Here´s an article on X-Yachts Haderslev where I spent a day with X-Yacht´s Sales Manager Flemming Ancher). “All stations ready?”, Richard asked. We were indeed. “Two men to the fore and throw Karl overboard!” Jacob and I raised Karl over the reeling and upon Richards go had him falling into the waves. As Karl hit the water he was left behind quickly. It´s a frightening thought to imagine oneself – or worse: a beloved one – being that person, but seeing with one´s own eyes how fast 7 knots really is, is even more intimidating. Karl was going up and down in our wake as Richard twirled the steering wheel and SY MARENNEITO turned quickly to luff, went through the tack and Jacob was pulling hard to haul in the main sail. Jib aback, the boat went full circle fast. Very fast indeed. I was astonished how little time it took to take us right beside the orange dummy. I was wondering if this can actually be too fast? Just imagine: Your wife or your child has fallen overboard and – after some shocking moments – you turn the wheel and bring the boat alongside again in a matter of seconds. Would it be so clever to do so? I mean, preparing the rescue gear and sorting one´s moods will take time too. In our case, everything has already been prepared in harbor, the rescue system was fitted in place and ready to be activated and this was also a matter of seconds. But can that be the case with real life cruising too? 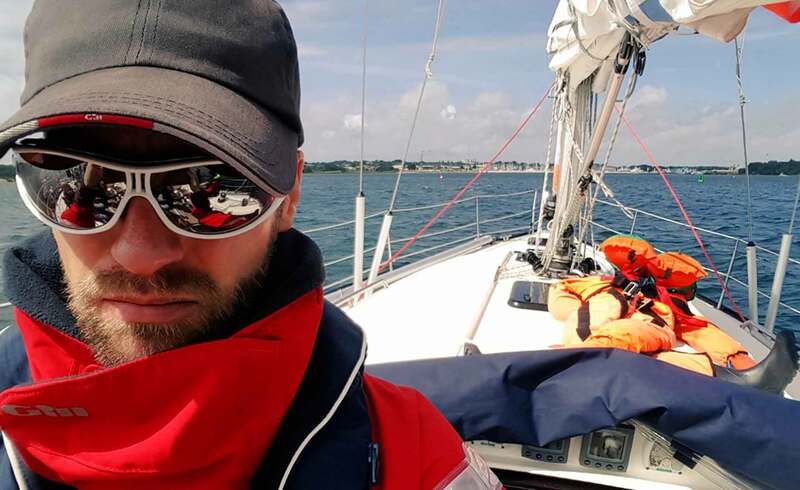 Sometimes missing Karl posed no challenge for an experienced skipper like Richard, who already had the engine running and it took him a few pushes to bring MERENNEITO back alongside Karl. The boat was dragging the net through the water, but again it took quite some time even for Richard to have the boat steering exact courses to “hit” Karl the dummy at the right angle. We tested some other variants of the Hamburg Maneuver, turning over port side now and starboard side then. I must admit, time went by so fast causing me to lose orientation quickly and oversight over the whole program. The skippers were having fun and Richard, Olaf and Andreas had lively conversation on the quality of each maneuver. Thinking back to my own sailing classes, I am thinking with mixed feelings to this first part of the test. Partially because I think my aversion against too fast maneuvers seems to be confirmed now by what I´ve seen during the test: Simply put, returning fast to the MOB-person means in the same time having to have everything ready for getting him or her back on deck. I can imagine that this is too fast for some sailors, especially thinking of skipper´s wives who are supposedly not as qualified and experienced seamen as their husbands are. Doing the Figure-8 – which is also a quick maneuver – could prove the better option because it allows a more precise approaching of the MOB-person on the one hand and leaves a minute or so extra time to get oneself and the equipment ready for action. Because: The real obstacle in a crew overboard incident is – in my view – not the coming back, but the getting the person back on deck. Now it was time for the systems to be activated. 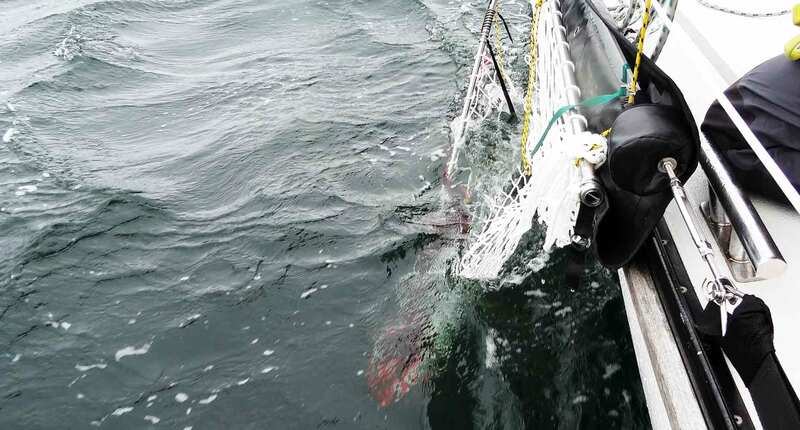 In short, both are based on the idea to have the Mob person being secured in a massive net and connecting this net to a halyard. 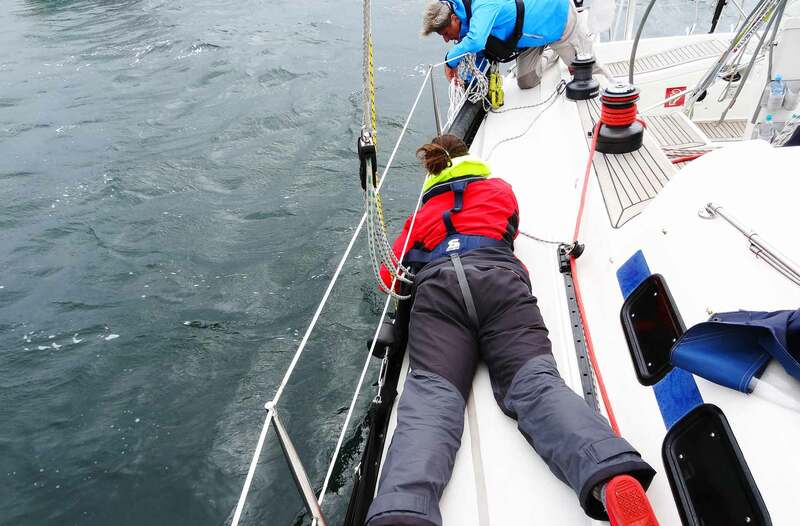 Then this halyard is put on a winch and the person is taken back aboard with ease. So much for the theory. Looks intimidating? It surely is! Practically this turned out to be tricky stuff. Sometimes we wouldn´t have had the right speed, causing the net to collapse and hindering the dummy to be secured. Sometimes waves and draft would drag the dummy right under water and – more frightening – under the boat´s stern. I often saw Karl´s live vest gleaming down below right next to the rudder of our boat. It was a hard struggle for Richard to steer in such a way that there was no risk of getting him sucked into the screw of our sailing yacht. For the rescue-team it was also a hard struggle. 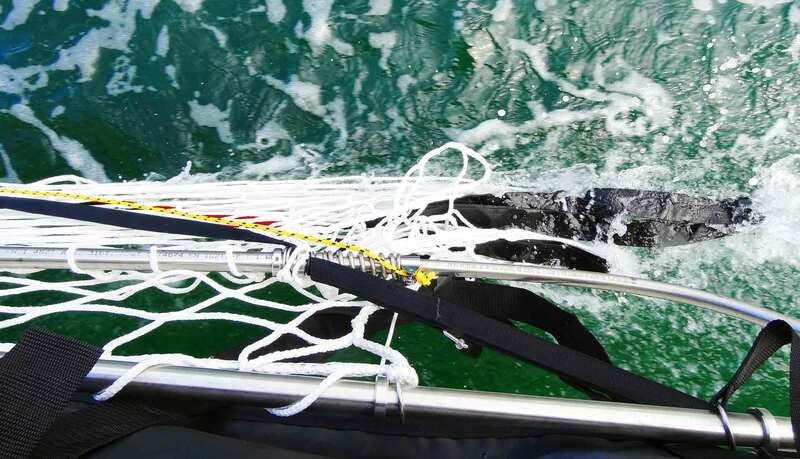 Both Mieke and Olaf were working hard, hand in hand, to sometimes grad Karl with their own hands, sometimes to hold him steady in the net and have the lines of the rescue system pulled in the right manner to secure him for being pulled up by the halyard. With all the swell and rolling going on, the shouting and the seconds ticking down it was a real frightening situation. Every second Karl stayed in the water meant a second of danger for his life too much. Sometimes we would lose Karl from the net, causing Richard to have another run to catch him with the rescue system again, sometimes a bigger wave was just wrestling him off the hands of Mieke and Andreas. Again, I was both astonished and shocked to observe the action going on because of the real-life character of this training session. Minutes went by and – to be honest – if Karl would have been a real human being he surely would have been drowned to death by now. Even having invested in the best available rescue system is no guarantee for a successful rescue for sure. This is hard, hard work! Haul him back on Board! After more than one hour of trying to get Karl back on board with one of the systems Richard quit and ordered the second system – slightly different in its function – to be installed and readied. This time I put away the camera and helped Andreas at the reeling. 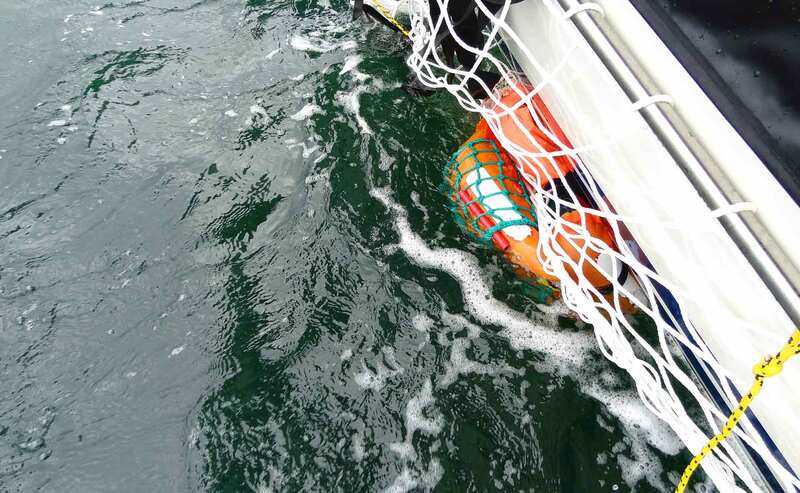 Just two clips and one push and the system was ready, spreading out its net into the foaming sea, seconds later Richard had Karl floating alongside again with Mieke and her “Hercules loop” ready to catch him and drag him into the net by hand. This time everything went by in a matter of minutes. Mieke finally had Karl in the loop, Andreas did clip on two shackles to the Spinaker halyard and Jacob began to turn the winch. Slowly the soaked dummy was raised out of the water and hauled back on board by Andreas. Even we did know that Karl was just a dummy, we all sighed in relief. After all, it was good of having succeeded in the end. I took a look at Mieke, who had her swim suit ready to put on but changed her mind after all: “Seeing the struggle, I pass to be the dummy person”, she said, smiling bright. But we all could perfectly feel with her – nobody would have jumped into the sea today. So what did I learn from the testing of MOB Code of Practice? First of all: Never. Ever. Go overboard! That´s really the first and most important rule on every seagoing vessel. 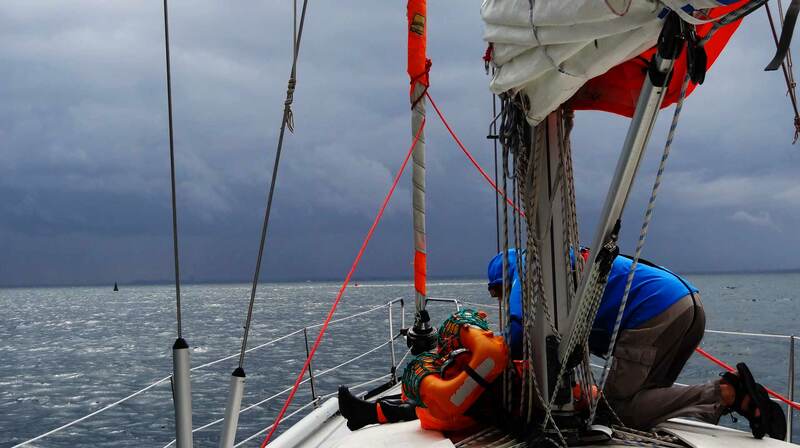 Everything must be done to prevent an MOB-incident in the first place, be it a proper safety briefing by the skipper, wearing lifebelts even in moderate conditions (and after dusk) or simply not leaving harbor when conditions get too rough. Secondly: Practice. Practice. Practice! 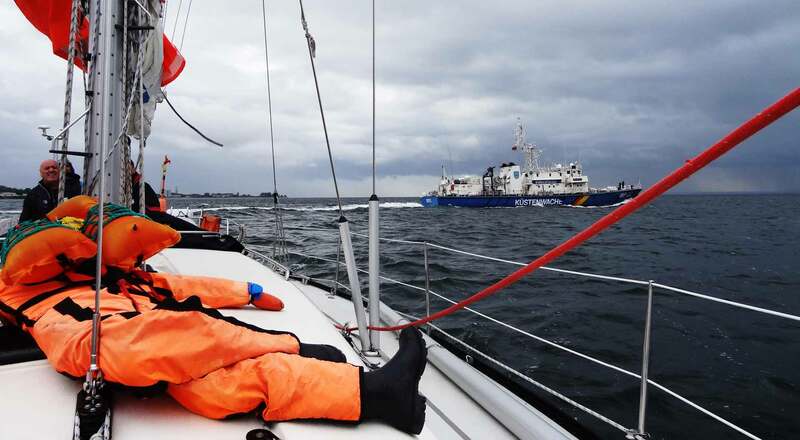 It´s simply just not enough to having done the basic skipper´s education and hope that the real case would never happen: A responsible skipper (and his wife!) would at last train MOB-maneuvers regularly and under most realistic conditions. Which means, not just “rescuing” a light buoy but also how to utilize certain rescue systems. In the end I think it really doesn´t matter which maneuver one would favor, be it the classic Figure-8, the regatta-style Quick Stop or other fancy stuff. Third: Always have the engine running ready to be utilized when the first approach turns out to fail. It takes simply too much time to haul the sails and have another run when your child is crying for help. Holding the boat on position or bringing it back with a few pushes should be a matter of the training as well. And last but not least, fourth learning: When a MOB-incidents happens in conditions other than no winds on a mirror-like sea (and after sunset), always push the distress-button! The stakes are simply too high. We returned to our jetty after two hours of intense sailing and practicing. Back in the rooms of the sailing school we´ve had a thorough de-briefing. Richard was asking everybody of our crew about her and his impressions of the day and the learnings. What went wrong? What was good? Where we would identify potentials for improvements? In the end, we didn´t find the perfect maneuver for the Crew Overboard incident nor did we identify the perfect rescue system. 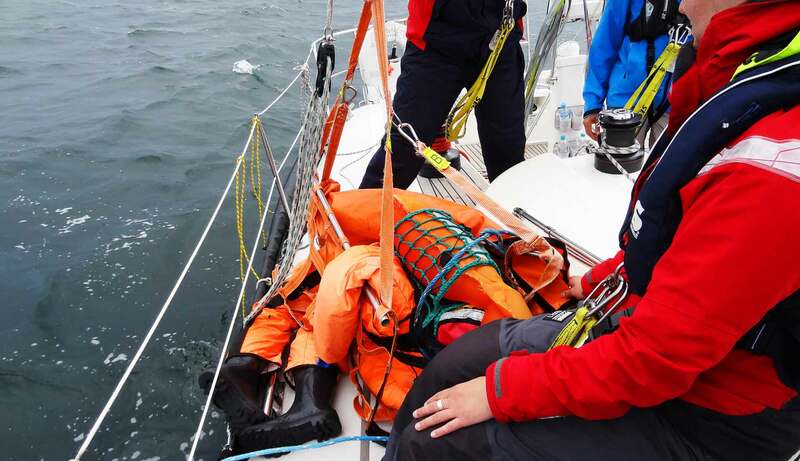 It was a both exciting and enlightening sailing session for me as well as it has been frightening to realize and really observe with one´s own eyes to conclude that there simply is no 100 per cent guarantee to perform the perfect MOB rescue. I am looking forward to our next training session. Maybe with different sailing techniques and approaches and improved rescue systems.